Kylian Mbappe got himself onto the scoresheet for France against Iceland on Monday before providing an outstanding assist for Antoine Griezmann. France won 4-0 in their latest Euro 2020 qualifier in Paris this evening, thanks to goals from Samuel Umtiti, Olivier Giroud, Mbappe and Griezmann. Mbappe finished superbly for his goal in the 78th minute after receiving a defence-splitting pass from Griezmann, before turning provider for the Atletico Madrid star to score himself ten minutes later. 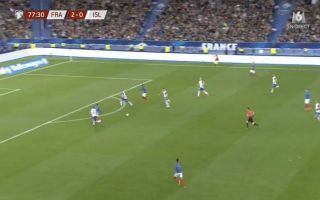 The PSG youngster produced an outrageous back-heel assist for Griezmann which was an absolute joy to witness before his colleague dinked the ball past the Iceland goalkeeper and into the net. Check out the two sublime goals in a comprehensive win for France below, via Twitter.